Running a data center takes a lot of work, and even making sure the ambient temperature for hundreds of boxes is in the proper range is an arduous task. When faced with the prospect of installing hundreds of temperature sensors in an EMC data center, [Vivek] had a better idea: put just a few sensors on a robot and drive around the racks. With the right software, it’s a breeze to automate the process and build a near real-time temperature monitoring solution for a huge data center. 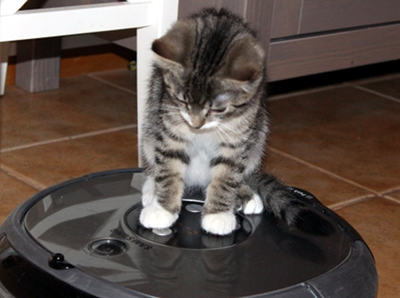 The data center robot is based on a iRobot Create, basically a Roomba without a vacuum. Attached to the robot is a netbook, Arduino, and a PVC mast housing three temperature sensors and a USB webcam. Using the floor of the data center for navigation, the robot canvasses the racks sending temperature data back to a server via WiFi. From there, the temperatures can be graphed to make sure the racks aren’t too hot or too cold. You can check out a video of the robot in action after the break. 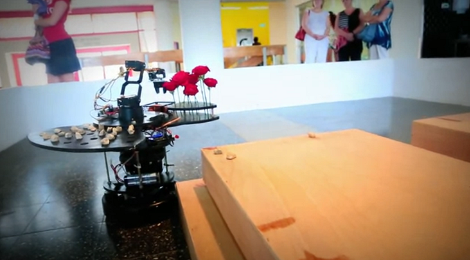 This robot was built to care for the graves and honor the dead in the Jewish tradition. It is called “Stoney” and was developed by [Zvika Markfeld] based on a concept by [Itamar Shimshony] who is working toward an MFA degree. The image above shows it in action as part of an installation; to our knowledge it has not been used for actual grave sites. But the concept is not a joke; it’s something that makes the observers think. The base of the robot is an iRobot Roomba on top of which is built a platform for a robot arm. The arm has easy access to two palettes, one holds small stones, and the other flowers. There is also a small box which holds a rag. It navigates around the grave, placing stones, flowers, and using the rag and a water dispenser to symbolically clean the headstone. All of this is controlled by an Arduino Mega board which controls another Arduino running the arm, as well as the microcontroller in the Roomba. The details of the ritual, as well as the components of the robot are well explained in the clip after the break.